Here are the winners from the third annual Sports Shooter Photo Contest. Winners were awarded prizes thanks to the generous donations from the following: Ronal Taniwaki of Nikon; Jody Grober of Roberts Distributors; Jeff Snyder of Penn Camera; Louis Feldman of Samy's; the Fujifilm Commercial Imaging Division; Lowepro; Lexar; Minds@Work and The Altamira Group. This years contest was judged on February 16, 2001 by Wally Skalij of the Los Angeles Times, Peter Read Miller of Sports Illustrated, Robert Hanashiro of USA Today, Rick Rickman of Newsport, Ronal Taniwaki of Nikon Professional Services and freelancer Brad Mangin. Special thanks to Nikon for hosting the judging in their Torrance, CA office. Fans at the inaugural AutoZone Park baseball game on April 1, 2000 between the Memphis Redbirds and the St. Louis Cardinals battle for a foul ball in Memphis, Tennessee. Awarded: Lowepro Pro Roller 1 case donated by Lowepro. 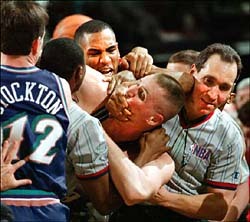 Portland's Steve Smith (center) and Utah's Greg Ostertag tangle late in the game, after Ostertag's reaction to losing a rebound to Smith turned into a near melee on February 27, 2000 at the Rose Garden in Portland, Oregon. Awarded: Lowepro AV650 bag donated by Lowepro. 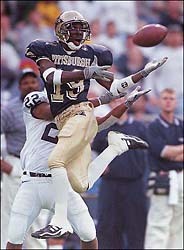 University of Pittsburgh defensive back Shawntee Spencer, breaks up a Rashard Casey pass intended for Kenny Watson in a game on 9/16/00 at Three Rivers Stadium. Awarded: Fujifilm Gift Pack donated by Fujifilm Commercial Imaging Division. 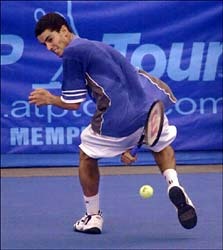 Andre Sa of Brazil returns a shot between his legs to opponent Magnus Larsson of Sweden during their semifinal match in the St. Jude tournament on February 19, 2000 in Memphis, Tenn. Awarded: Digital Wallet donated by Penn Camera and Minds@Work. 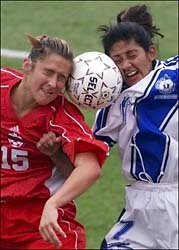 Christine Latham of Canada (L) and Monica Cardenas of Guatemala (R) fight for possession of the ball during their first round Women's Gold Cup Tournament match at Papa John's Cardinal Stadium on June 28, 2000 in Louisville, KY. Awarded: Lightware Digital Backpack donated by Roberts Distributors. 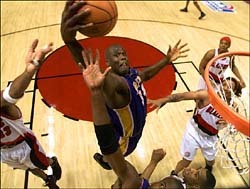 Shaquille O'Neal grabs a rebound in game 4 of the Western Conference playoffs in Portland, Oregon on May 28, 2000. 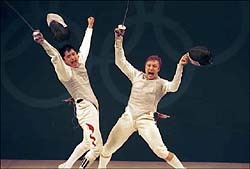 Tied at 44-44, China and France appeal for the point to award the match and Gold Medal to the winner. Team Foil Final, XXVII Olympiad, Sydney. Awarded: Lexar 10x 160 meg Flash RAM Card donated by Roberts Distributors and Lexar. 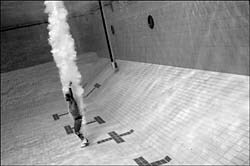 A lone diver practices before competition in the Sydney Aquatic Center during the 2000 Olympic Games. Awarded: Lowepro AV600 bag and a Hoodman E2000 donated by Penn Camera. USA Men's 4x100 relay team member Jonathon Drummond shows off after winning the Gold Medal with a time of 37.61 at the 2000 Olympics. Lenny Krayzelburg swims to win in the Mens 100m Backstroke during the Janet Evans Invitational on July 15, 2000 at the McDonald's Swim Stadium in Los Angeles, California. 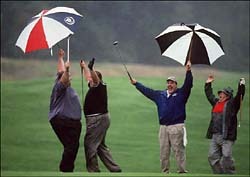 The 1500 pound winning foursome at the Fatty Golf tournament in New Haven, CT celebrates John Hardy's (left) long putt on July 31, 2000. The annual tournament at Yale funds research for eating disorders. 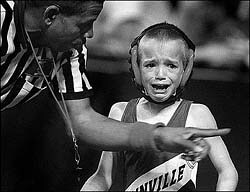 Eight-year-old Brandon Bacon had a hard time composing himself enough to shake his opponents hand after losing a match at the Kansas state kids wrestling meet on 3/25/00. Deone Whitaker, tailback for San Jose State, was chosen as one of the Athletes of the Semester by the Spartan Daily staff. He was one of the top rushers in the nation during the 2000 season. A gymnast practices his routine during practice on 6/28/2000 at the U.S. Olympic Training Center in Colorado Springs, CO.
Shark's goalie, Evgeni Nabokov, lies flat on his back attempting to make a save against New Jersey Devils, Jason Arnott, left, and Bobby Holik. 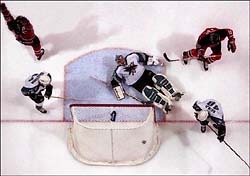 The Devils scored their first goal and went on to win 3-2 at the Shark Tank in San Jose, California, November 26, 2000. 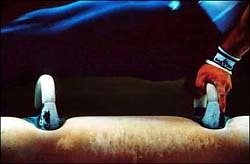 Russian gymnast Elaena Zamolodchikova, 3rd ranked individual all around current world champion, crashes off the beam during the Women's Team Final gymnastic competition on September 19, 2000 at the Sydney Summer Olympics. The Russians won silver as a result, while the Romanian team won gold. Awarded: Nikon Coolpix 990 camera and a Lexar 10x 160 meg Flash RAM Card donated by Nikon, Roberts Distributors and Lexar.